I have known my whole life that I have had a heart murmur. I was told that it was no big deal and not to worry about it. So, I didn’t. Later in life, when I was told I should have my heart murmur checked out, I used my athletic accomplishments as an excuse not to. However, something happened early in 2014, which started to change my mind. In 2014, my life took a dramatic change for a number of reasons. My rigorous work schedule required me to work 7 days a week, 10 to 12 hour days starting at 4:30am. 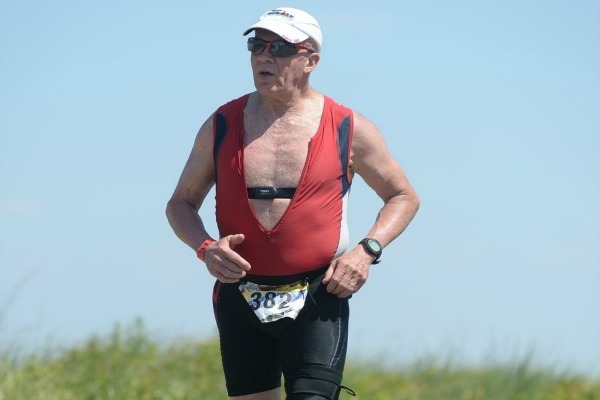 I was turning 65, and I asked myself, “what the hell am I doing to myself?” So, I quit being a personal trainer and endurance coach for Lifetime Athletic and started focusing more on my clients at Tri Fitness and Coaching. I discovered that while working to help others become healthier, lose weight and achieve their athletic goals, I was not taking care of myself. While biking with my wife and a few friends, I began to feel dizzy. I chose to keep going and stop to rest at the top of a hill. That is the last thing I remembered. The next thing I knew I was on the other side of the road looking up at everyone looking down on me. The paramedics noticed my heart murmur and suggested I go with them to the hospital. I told the paramedics I didn’t eat or drink enough on the ride and had low blood sugar and after eating something I would be fine. After this incident, my wife started nagging me to have my heart checked. My doctor had also been doing the same for years. Every year, when I was getting my regular physicals he would give me a prescription to get an echocardiogram to check on the murmur and every year I would ignore his advice. Finally, I decided to listen. Normally when I have a test done , Marc, my doctor, would say, “Lou, I got your test results back, everything is fine.” This time he said to me, “Lou, I got your tests results back, come into my office.” He told me that I had severe calcific aortic stenosis and a bicuspid aortic valve and needed to see a cardiologist immediately. This caused a whirlwind of events. I first saw a cardiologist on 6/15/14, who did a stress test which confirmed the seriousness of the trouble I was in. The cardiologist told me that I had no recourse. I needed to have my heart operated on immediately. The earliest appointment I could make wasn’t for another 2-1/2 weeks. I called my cardiologist and told him this and asked him if there was anything I should do in the mean time. He told me to keep my heart rate low and take a baby aspirin. While teaching a spin class on Saturday, June 18, 2014, I thought I was taking it easy and keeping my heart rate low, but I guess I wasn’t keeping it low enough. Towards the end of the class I started feeling dizzy with some chest pressure. I slowed down and took it easy until the end of the class. This pressure persisted for several days. My cardiologist told me to go to the hospital immediately and have some tests done. I put it off because I had clients to train and decided to go right after lunch when I had a break in my schedule. Both my cardiologist and my wife wanted me to go to Morristown Hospital, the one he was associated with. That hospital was over 20 minutes away so instead I decided to go to the hospital right around the corner. My thinking was that I could go there, get the tests done and leave to train my afternoon appointments. I walked into the hospital and didn’t walk out. I was admitted to the hospital on Monday, July 21, 2014. The cardiologist visited me on Tuesday July 22, 2014. The surgeon visited my on Wednesday, July 23, 2014. After having the tests done, my cardiologist ordered that I be transferred by ambulance to Morristown Hospital as soon as a bed became available. The following morning, July 24th, at 7:00 a.m. I was wheeled into the operating room where they replaced my bulging aortic stem and defective bicuspid aortic valve with a new bovine valve. I woke up after four hours a new person. My life had changed. My body had been violated and a part from a cow was now keeping me alive. I can understand why so many people who go through this procedure have bouts of depression, and I think it is worse for an athlete. Someone who calls upon their bodies to go above and beyond what most people think is possible and now their body has let them down. They are told not to do this and not to do that. However, this philosophy is contradictory to how most athletes think. If there is one thing I have learned through my own personal experience and the experience of the clients I train and coach it is that the human body is capable of phenomenal things and can always do more than is thought possible. In the past I was told I couldn’t run because of the multiple knee operations I had. Instead of listening to this advice, I learned I could run if I did certain things. I did it so well I was able to come in top 10 in my age group at the Ironman World Championship in Hawaii. This was the same philosophy that I was now going to apply to my cardiac rehab. When one doctor told me, “no, you can’t do that”, I would keep looking until I would find one who said, “Yes, you can”. On July 20th of this year, I did the NJ State Olympic distance triathlon, which was four days prior to the one year anniversary of my surgery. I was 9th out of 12 people in the 65 to 69 age group. Two months later, on September 20th, I did a half-Ironman triathlon. I refuse to live my life in fear over what might happen. A life lived in fear is a life half lived. Since completing my first triathlon in 1989 and especially since devoting myself fulltime to helping people as a fitness professional in 2007, I have seen first hand what is possible when we apply proper training with proper mental attitude.